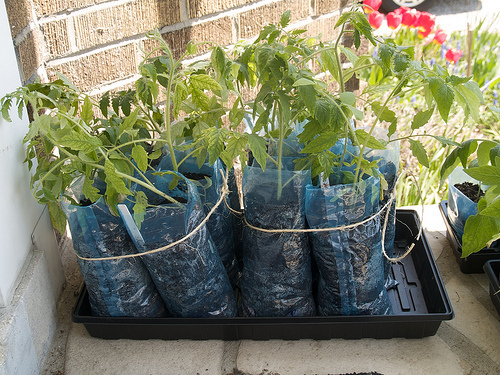 I’ve finally begun disseminating the tomato and chile seedlings. 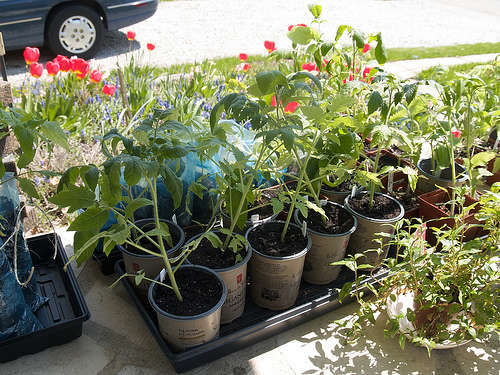 I just repotted a second batch of seedlings because I had run out of room earlier with the first batch. They’ll take a week or two to catch up but the ones I repotted about three weeks ago are huge and need to go in the ground ASAP. Over the last couple weeks I’ve been working on hardening them off. Considering that means moving dozens of small plants in and out and in and out, it’s been quite a bit of work. But they’re now quite acclimatized and I think it’s safe to leave them outside at night from now on, barring any more risks-of-frosts like we had on Monday night. I’ve given out a few here, a few there and I’ll have a few more to go. Next weekend I’ll be planting some in the garden. As for things crafty, I’ve taken a stab at making my first quilt. I guess technically it’s a baby quilt. A couple of months ago I was really interested in taking a quilting class, but I couldn’t find anything that started at that time (most places’ classes were already underway), and I didn’t really know what kind of quilting I wanted to do. I recently found a place to get my mom’s old sewing machine fixed, a Singer from the late 1960’s. I’d had the machine for probably 10 to 15 years, but it always jammed, and other places I’d taken it to didn’t do squat to fix the problem. I didn’t have the heart to get rid of the machine, and many a fibre artist had told me that you just can’t get machines like it anymore. So I held out hope and finally, through my friend Michelle, found Sewing World (ironically, located in my old neighborhood in a plaza I went to nearly every weekend to do my laundry and shopping). $100 later and my machine is running like a charm. Given that I haven’t had any quilting classes (yet) I kind of had to muddle through on my own, with the help of some books, but it was not that hard as this is a simple design. I have more of the same fabric in “boy” colours, for another one (there are a few babies on the way in my social circles). I had read that a cotton-polyester blend would be fine for quilting, however, at the fabric store the woman who cut my yardage said that most quilters she knew swore by 100% cotton, and now I can understand why. This fabric is very, very thin and flimsy, without a lot of structure. 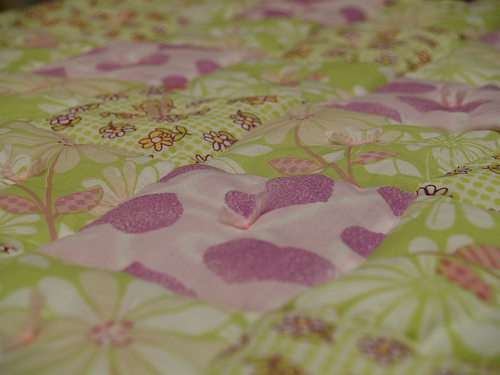 As a result the quilt has a bit of a “manufactured” feel, which I dislike. But at the same time the fabric was super cheap, and I didn’t want to invest a ton in it in case I made a mess of the whole thing. I was a bit stumped with how to do the binding (edges/seams) but I did some reading online and tried a pillowcase method. 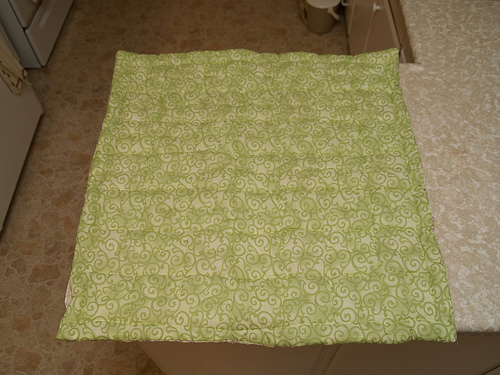 It works well enough for this but it means that the quilt bunched up when I did the machine quilting. 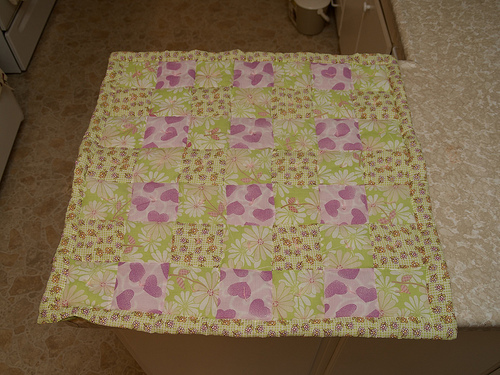 So for the next one I’ll do the quilting first, and then figure out the binding later. I just found online instructions about binding are quite difficult to grasp. I also tried “stitching in the ditch” and that was sort of successful. And for the tying, I tried embroidery floss first, in little “x’s” and that wasn’t working so well. So instead I used yarn to tie off the quilt, and because I didn’t want the yarn to undo, I put a dab of Fray Check on each yarn knot, which should bind the fibres so they don’t come undone. Since I’ve got my sewing machine in excellent running order, I’ve been doing other little repairs and hemming and things I’ve avoided because whenever I tried to use my machine I ended up pulling out my own hair in frustration. Now I’ve got hemmed curtains in my bedroom instead of safety-pinned curtains (imagine that!). Hardening off starts out kind of thrilling as it seems so novel in the new spring warmth but then it really gets tiresome towards the end doesn’t it? It looks like you have great things to look forward to as a result of your labours though!